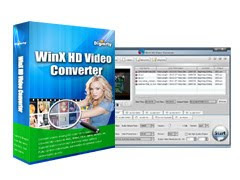 Early month, we had chance to get WinX DVD Ripper for free, this is a product from WinX DVD company. Today, it giveaway another produce - WinX DVD Video Coverter. It is very easy to get it, just go to Giveaway page, download file and write down registration ID and code. All done. It costs $39.95 US dollars, you pay nothing now. This offer starts from Dec.1st and will expire at 12:00am GMT Dec. 16th.